A one-room Vermont mountain Cabin one mile to picturesque Belmont Village and Star Lake, and 6 miles to Okemo Resort and Ludlow. Enjoy this guest cabin on a knoll above our home, with a deck overlooking Star Lake, meadows, mountain vistas and spectacular sunsets. Sleeps 1 or 2 guests (Queen); completely renovated with new, modern kitchenette and bath. A beautiful mountain get-away, yet close to activities. Nearby to mountain lakes - swim, fish, boat rentals. Central to sightseeing, golf, tennis, horseback riding, hiking, biking; near historic Weston Playhouse and Weston Priory. Surrounded by Vermont forests and autumn foliage. We are in the heart of the Green Mountains between Killington and Stratton/Bromley. We have beautiful (spectacular!!) views off to the west and northwest (great sunsets). The cabin sits on a hill, at the edge of a pasture, at 2100 feet above sea level and overlooks a lake and mountains beyond. We are one mile from Star Lake which has a beach and boat access. Share our corner of Vermont paradise, surrounded by 180 acres of our land, and hundreds more acres of friends, family and the State of Vermont. We have our own trail network for hiking, and there's lots of other hiking all around the town and local area. On our land across the road from the cabin there are four beaver ponds that string along a brook that runs into Star Lake. 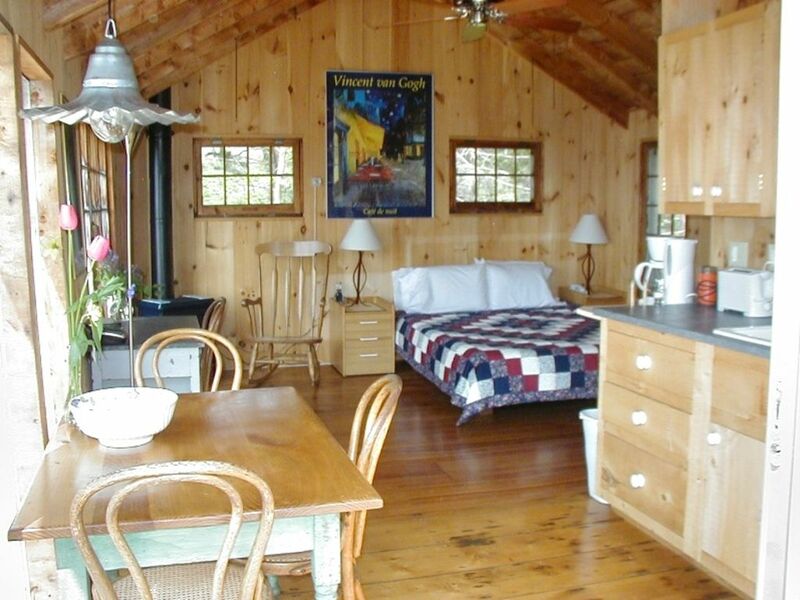 Although nestled away in the hills of Vermont, our cabin is in the heart of the Vermont ski and tourist area so there are lots of restaurants, shops, and activities within 5 to 10 miles. DOGS allowed with permission; please inquire when booking. NOTE – no TV, so enjoy a real get-away vacation :) ... tho the cabin does have hi-speed internet :):) and a radio/CD player. For WINTER rentals see our ski cottage, VRBO #71156, or call/email for more info. we have a 75 miles view across the Green Mtns into NY State. they allow pets. We enjoyed getting up in the morning, making coffee and having breakfast out on the deck watching the sun rise and in the evening watching the sun set. Everything about this cabin was perfect - the location, the view, the amenities... The little stove kept the cabin nice and warm even during quite a rainstorm and chilly temperatures outside. We were there at the perfect time to enjoy the fall colors at the end of October. The nearby town of Ludlow is adorable and had great shopping and restaurant choices. There's a hiking trail at the end of the street that is fantastic and just gorgeous! On a clear night, the starry sky is unbelievable! We were not disappointed in any way! The cabin is well maintained and immaculate! We hope to return! Cabin was cute and in beautiful location. Hosts, Dottie and Ron, we're always ready to help but not intrusive. Only problem was something no one could control...heat wave that also ruined fall colors. Would certainly recommend a stay in this lovely cabin in the woods. It is a lovely cabin with a great deck with beautiful views of the mountains and the sunset. It is very peaceful and relaxing! I can't say enough good things. Ron & Dottie leave a book with great information about the area and if you need anything they are very helpful! Wonderful! We got married last weekend and needed a few days off the grid to ourselves. This was a beautiful escape to unplug and relax! Also close to Okemo, where we hiked and mountain biked! Tons of great restaurants to try and a grill on the deck if you want to stay in. Very comfortable stay, and the owners were very kind and welcoming! Thank you!